the quest continues!! for those of you new to thecookieblogger site, you may not realize that i am in the process of what i have termed ‘the impossible cookie quest’. more difficult than chasing windmills and possibly even more difficult than landing on the moon, this quest to recreate a favorite cookie from my childhood – the conti’s chocolate sprinkle cookie – has been haunting me for years. now that i live 3000 miles from all those italian pastry shops in the bronx, the only way to satisfy my craving for these delectable bites of heaven is to make them myself! but, i’m completely stumped. i’ve tried everything, including writing a letter to conti’s requesting their recipe. but alas, no response. and still no sprinkle cookie recipe. so, as i muddle through my voyage to perfect this cookie, i have stumbled across another recipe that comes close in taste, but completely misses the boat on texture. oh well. it’s not what i was hoping for, but it’s quite good. with a bit of almond aftertaste from the extract, and a nice, light chocolaty taste from the real chocolate sprinkles direct from king arthur flour, they are light and refreshing cookies! a good choice for a light summer cookie! 1. preheat the oven to 375 degrees. line the baking sheets with parchment paper. 3. add sugar to butter and mix until well combined. 4. add egg yolk and almond extract until completely combined. 5. add flour and mix just until combined. 6. using a #40 cookie scoop (approximately 2 teaspoonsful), place dough 2″ apart on your prepared baking sheets. using the bottom of a glass dipped in granulated sugar, press down to flatten each mound of dough. 7. bake for 8-9 minutes, until cookies just begin to color at edge. remove from oven and let cool for approximately 1 minute on baking sheet. remove from baking sheet and cool completely on wire rack. 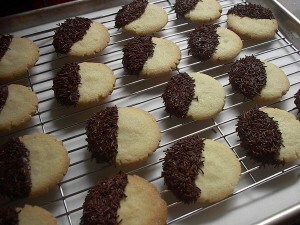 8. when completely cooled, dip one edge of cookie into melted chocolate, then dip in chocolate sprinkles. place on wire rack allowing chocolate to dry completely before stacking in airtight container.